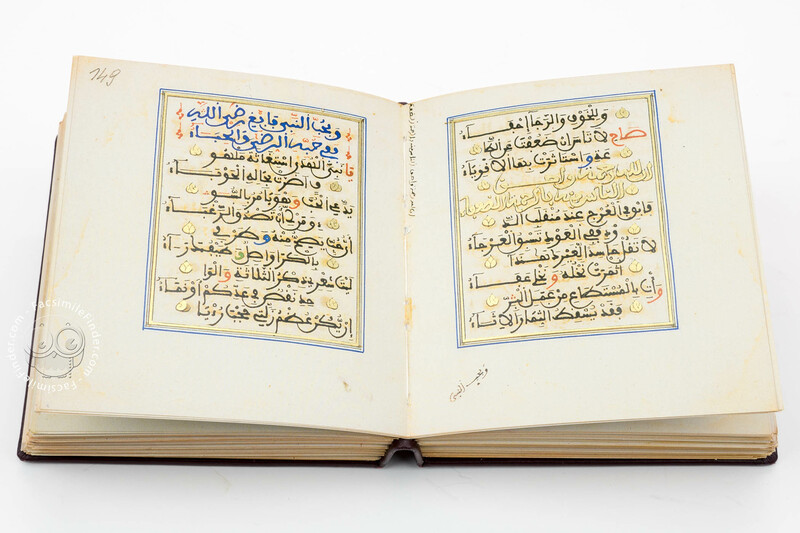 The Dala‘il al-hayrat is one of the most frequently copied and most read Arabic writings of religious content: Instructions for Charity. Al-Gazuli came from the Berber lineage of Gazula in the Moroccan city of Sus where he was born and raised. He began his studies in his homeland but later travelled to Fez where he entered the Madrasat asaffarin and wrote in his most infamous mystic writing; Dala’il alhayrat. The Instructions for Charity is in itself unique due to its’ particular style. It is written in a rhythmic prose whereby the continual repetition of parts of a sentence visibly stand out. One has the impression that the book was conceived for a particular recitation purpose which seems to have been the authors’ intention because in the text he uses repetitions to “facilitate the reader to learn by heart”. Up until today, this prayer book is still read on weekends or religious holidays together in chorus, loud and without pause. The recitation begins with a soft rhythm and increases slowly until it reaches a climax in the last verses. 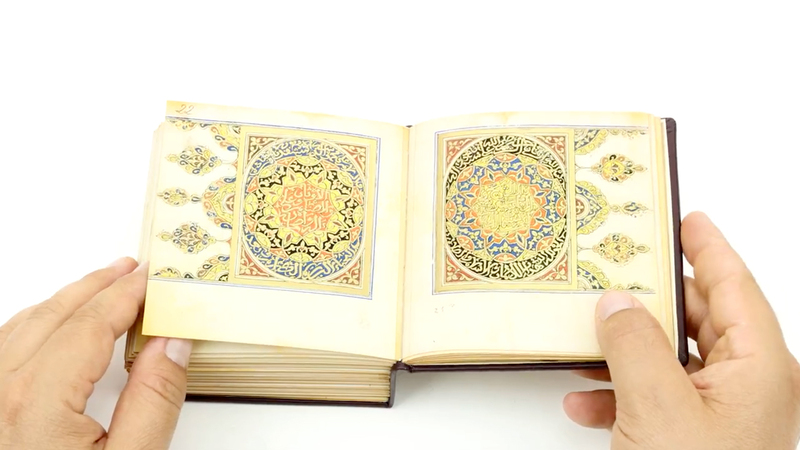 The ongoing use of the Dala’il al-hayrat up to the present day, as well as the production of numerous copies of the prayer book in existence are a testimony to the extremely large popularity of the codex. Virtually every library in the Orient and in Europe own one or more versions of this work. 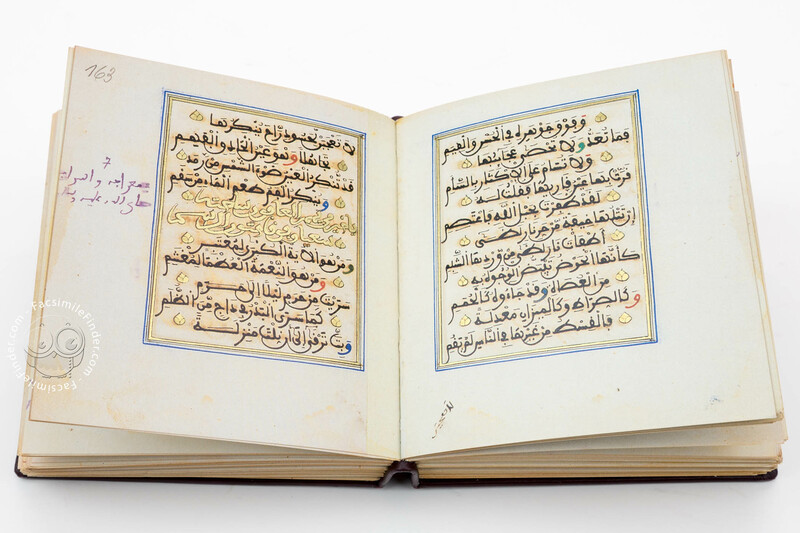 Many affluent Muslims have had splendiferous copies of the manuscript manufactured. 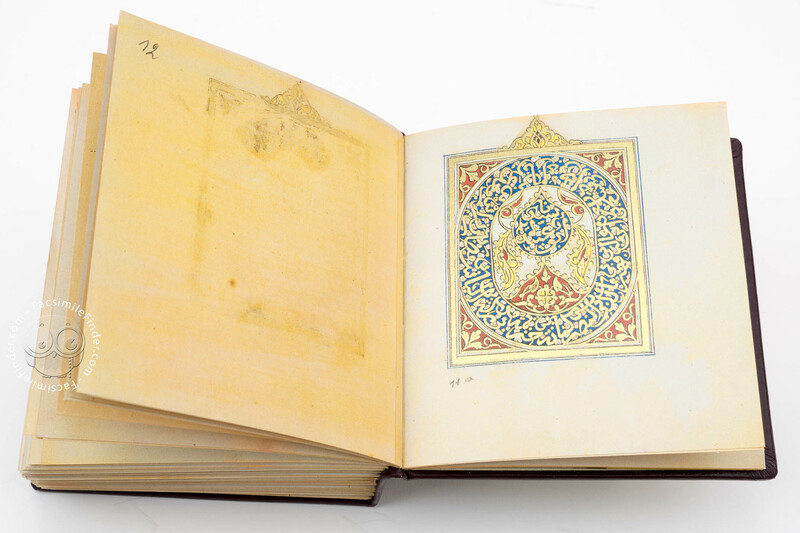 One of the most beautiful of these is the Codex in Vienna, which was presumably owned by a tribe leader in Gambia or Mauritania. 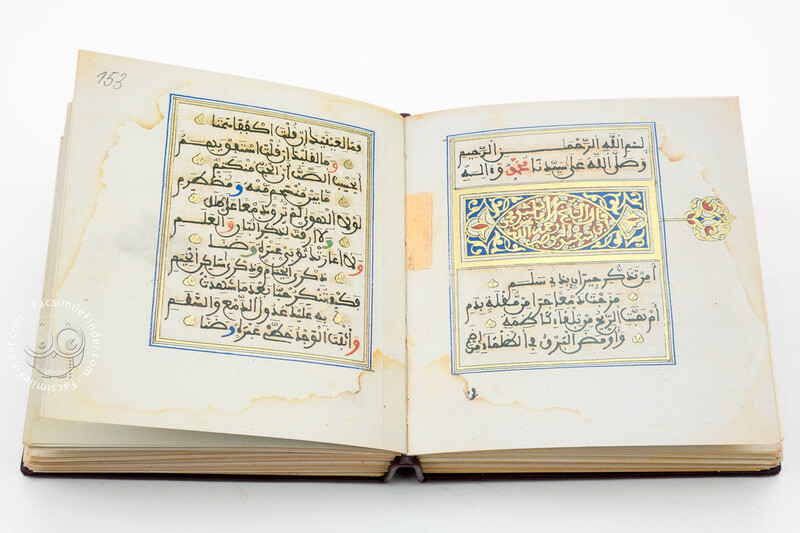 The completely preserved prayer book contains an Arabic text which is written in a late western developed Magribi writing. 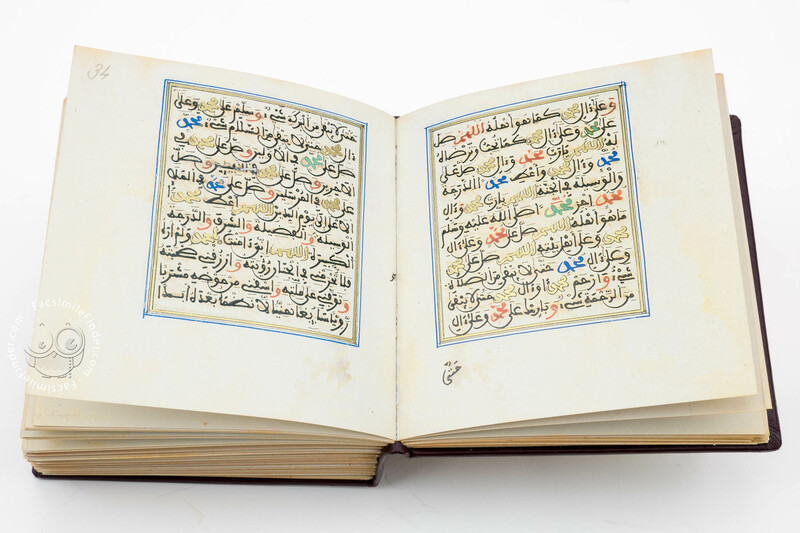 The calligraphy is truly appealing not only due to its exacting style in the written characters but also because of the use of coloured inks; black, gold, red, green and blue. Every title block on the text pages are bordered with gold and blue bars. 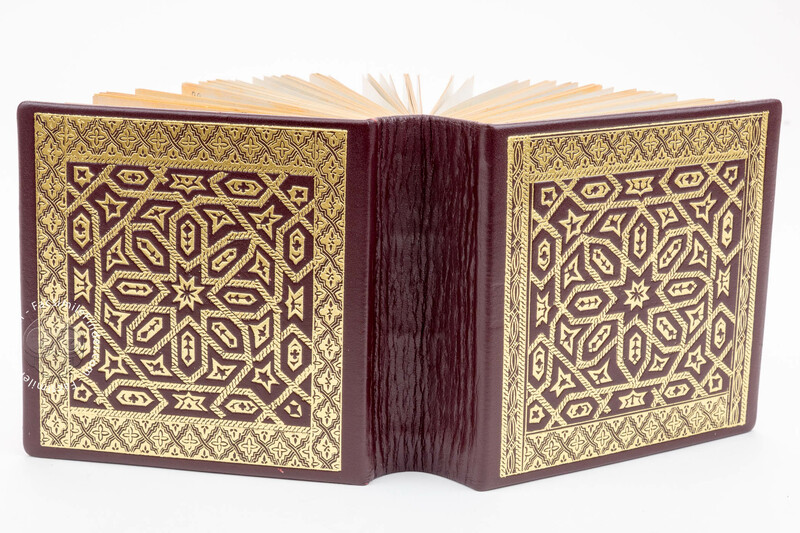 In addition there are numerous ornamented pages decorated with geometric and floral shapes, artful accents in arabesque entwined in a variety of colours. 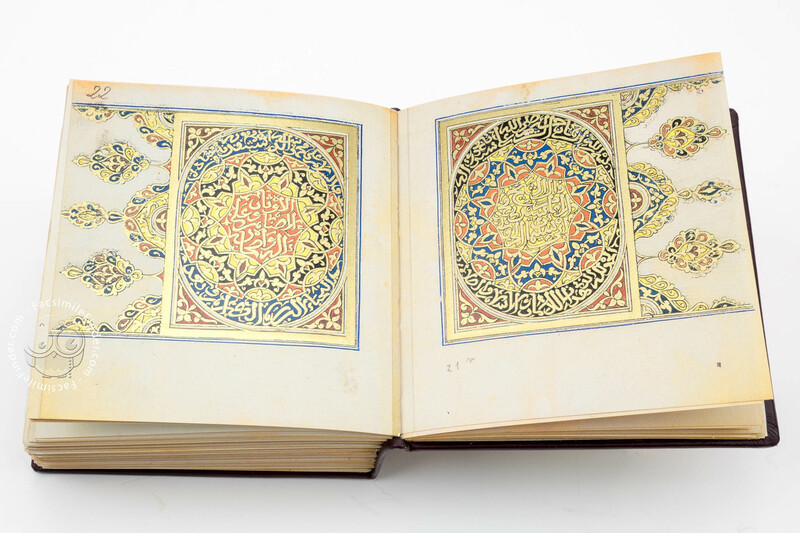 The subtle characteristic style of the writing and decoration in the prayer book indicates a skilled artist who has succeeded in creating one of the most beautiful examples of North African book art. 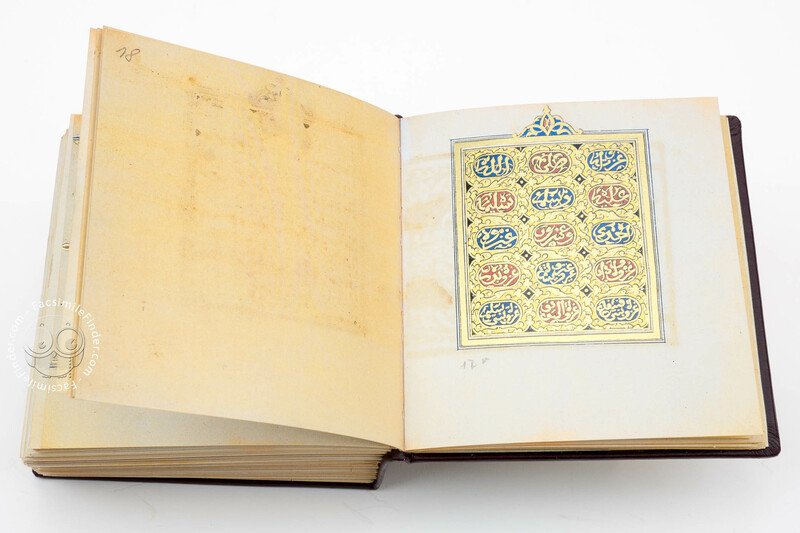 Manuscript book on parchment − 11.4 × 11.4 cm − 318 pp. 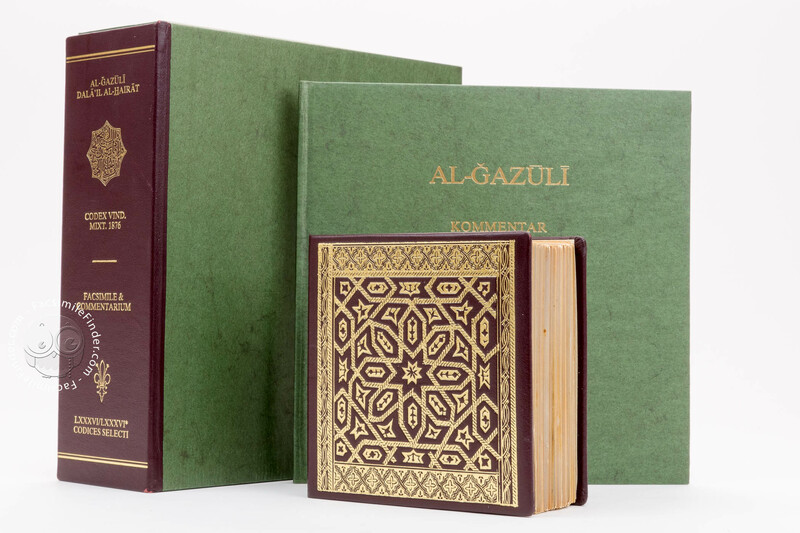 Full-size color reproduction of the entire original document, Al-Gazuli: the facsimile attempts to replicate the look-and-feel and physical features of the original document; pages are trimmed according to the original format; the binding might not be consistent with the current document binding. Facsimile and commentary volume in a box.